We started our investigations just round the corner from our accommodation, The Dales Hotel in Upper Sheringham. 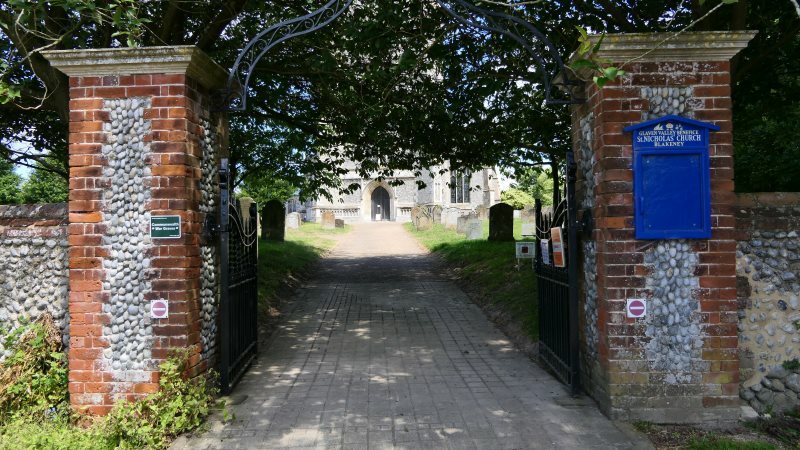 Disappointingly, All Saints Church, Upper Sheringham (left) gave us nothing of note. 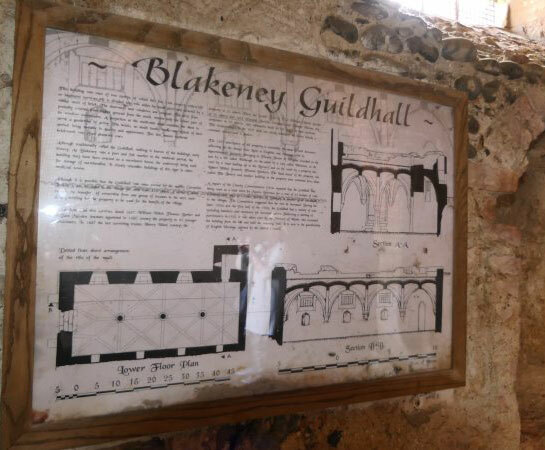 There was no sign of a Hooke brass that had once been displayed on the walls. Understandably, such artefacts are removed over time. 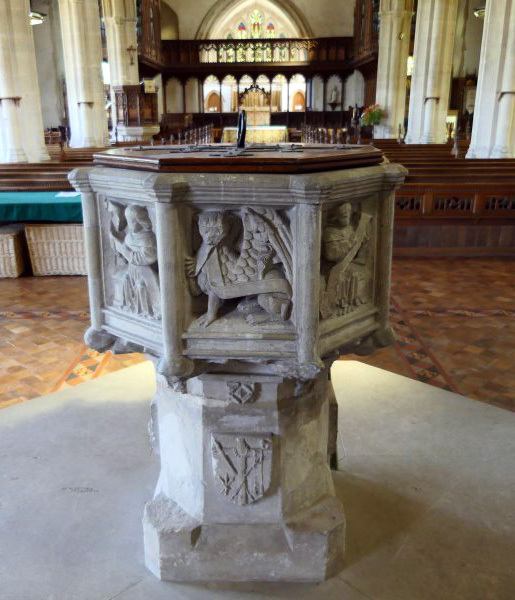 We took photos of the church and font (right), undoubtedly the place of many a Hooke christening. It was a gentle eight mile drive west to Blakeney where the tide was out. 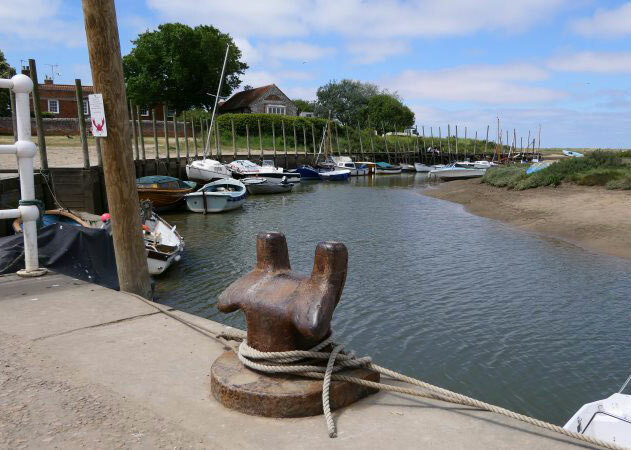 Blakeney was once a thriving port until the river silted up and the coastline receded. 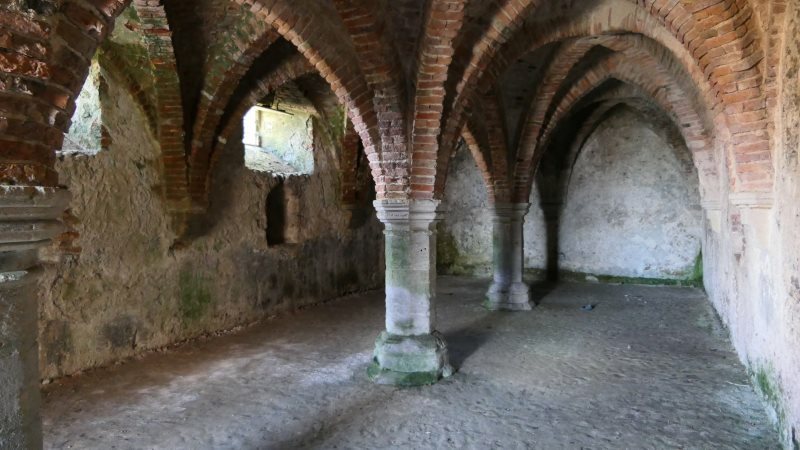 We took time to enjoy the promenade, climb the small coastal hill for the view and take a look inside the oldest building in the village - the basement of a merchant's house. 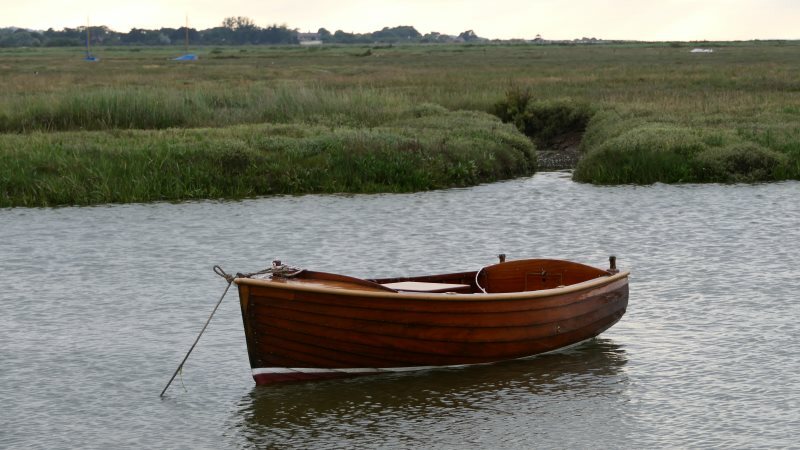 See some photos of Blakeney below. Click on each image to see the full picture and details. St Nicholas' church is on the edge of the village and we searched the graveyard in vain for any sign of a Hooke grave. Many were so weathered they were impossible to read. However, just before we were to leave I checked Cyril's notes from the 1960s and realised that we needed to look for a Jackson stone rather than a Hooke stone. 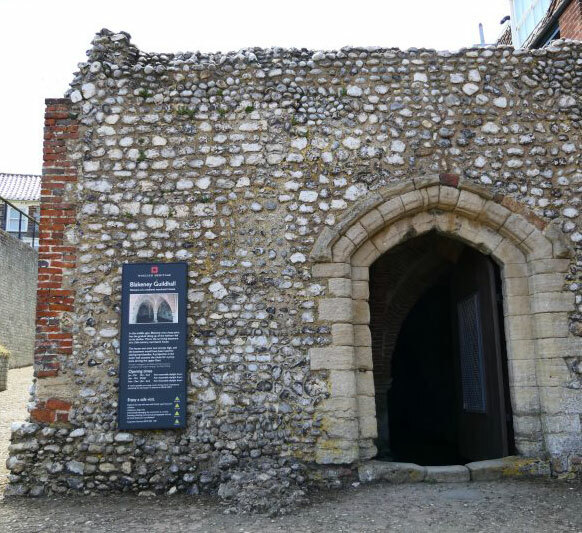 We were quickly rewarded with three prominent stones just to the left of the main entrance. Cyril had traced our Hooke ancestry back to a Thomas Hooke (1695-1764) and his wife Bridget (1699-1778). They had five children, the fourth of whom was also named Bridget, but known as Biddy (1736-1814). She married a certain Michael Jackson (May 25 1760) and her gravestone is clearly visble with the larger inscriptions legible. We struggled with the smaller text at the bottom as, even after removing the undergrowth, some words were well-worn. 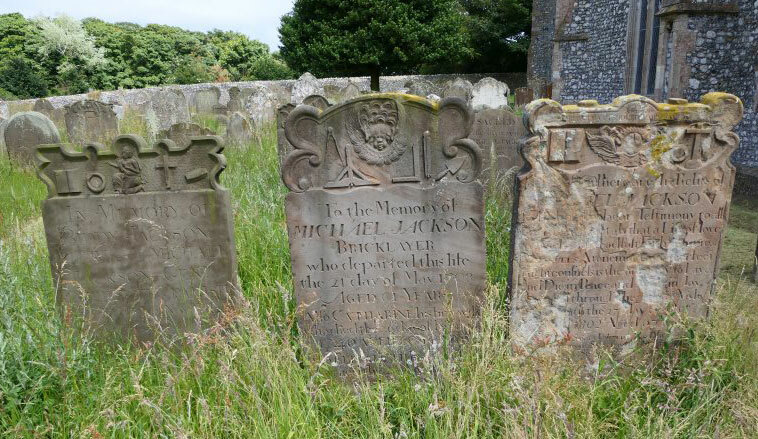 Alongside Biddy Jackson's grave is the grave of a certain Michael Jackson (right), inscribed with images of the tools of his profession - a bricklayer - the text as follows. It would seem that this is not the same Michael Jackson married to Biddy, though undoubtedly related, as the inscription indicates two wives, neither of them being Biddy. 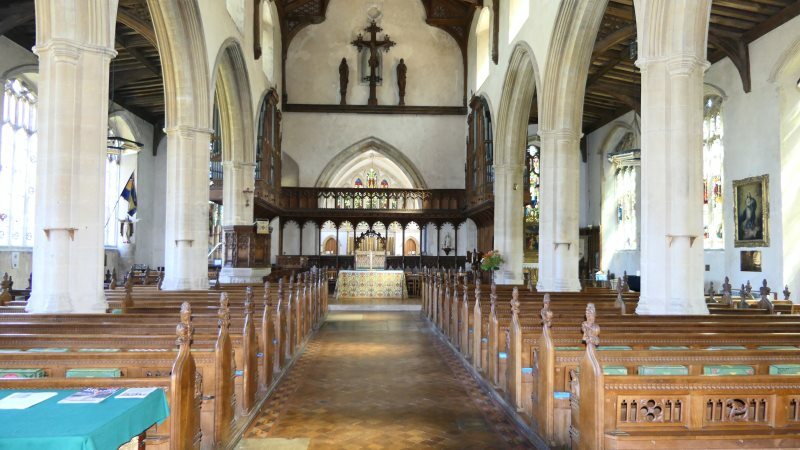 We then travelled east to Beeston St Mary's to continue the search of our Hooke ancestry. To add: Write about Thomas Hooke of Blakeney and add transcript of his will. He had a boat.